Great recipe! 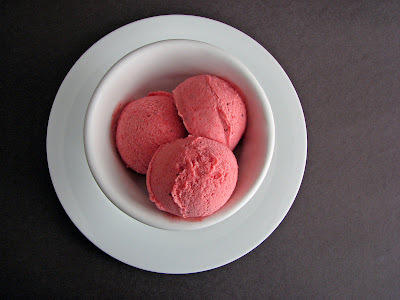 I am actually going to be making some sherbet this weekend too. I just love the bright colors of your photos! Great job once again. This is so perfect for spring/summer. It sounds delicious - thanks! ARRRG! I want an ice cream maker SO BAD! This sounds amazing! Look at that gorgeous color! The epitome of Springtime. I love it! Mmmm... that looks amazing. I can't wait to get my hands on that first pint or three of fresh berries! I absolutey adore strawberries so I definitely must try this sherbet with balsamic vinegar. 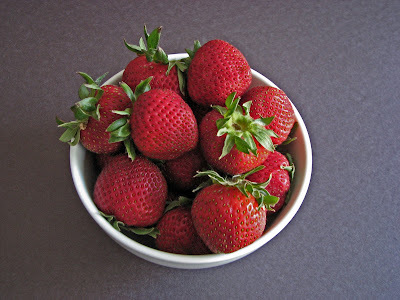 Unfortunately April is not a season for strawberries in Poland so I am forced to wait a couple of weeks more to be able to try it out. What a torture!!! Perfect summer dessert! The photos are great too! Hello berry lovers! I hope you are anticipating this season's crop of fresh fruit as much as I am. 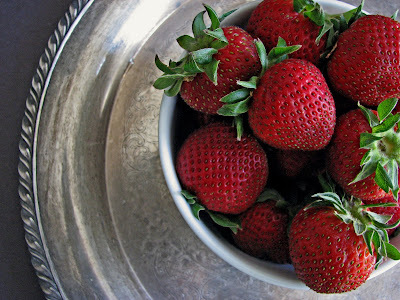 First, the strawberries. I hope you get a chance to try this sherbet - it's so easy and fast and a real reminder of all the tasty wonders of the natural world. Cheers! What kind of ice cream maker do you have in mind for this? The old wooden crank kind? The Cuisinart ones I see advertised? Something I haven't even heard of? Helloooooo little dog! I just have a little Cuisinart at home. A very simple and reliable machine. Not very expensive and worth every penny! That looks so good. 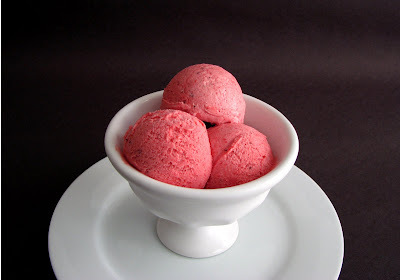 Strawberries and balsamic vinegar are a good combo and using them in a sherbet is a great idea! Now, I have the perfect recipe for my balsamic vinegar!! Thank you very much!! Only one question: what type of cream do I have to use? Whipped/whipping/plain? Thanks in advance! Elisabetta, it's heavy cream. I will go in and change my post so it's clearer. You can use whipping cream if that is what you have on hand. FYI, heavy cream has 36% - 40% butterfat and whipping cream has 30% butterfat. For ice creams and sherbets, the higher butterfat content is desirable! Thanks so much for your question and I really hope you enjoy this special ode to the glorious strawberry! I made this recipe over the weekend and it's so delicious! It was the perfect thing for all the fresh berries I had. karyn, I'm so glad you enjoyed it. It's simple, easy and really delicious. What more can you ask for?! karyn, I just visited your blog and it's really stunning! I love fabric and design and all the things you write about. Thanks so much for stopping by so I could discover it. I finally managed to prepare it too.. it is really awesome!! Can I translate this recipe in italian for my blog? Many thanks for inspiration!! I am enjoying some right now--it's PHENOMENAL!!! Thanks for the recipe! !